The Enterprise accepts the assistance of a Mr. Kosinski, a propulsion specialist who claims he (along with his nameless alien assistant) can improve the efficiency of the ship’s engines. Data and Riker are not convinced–they’ve run the models, and the models indicate no improvement in speed or performance. Moreover, Kosinski is an arrogant, self-satisfied schmuck (and yet strangely not a commodore! 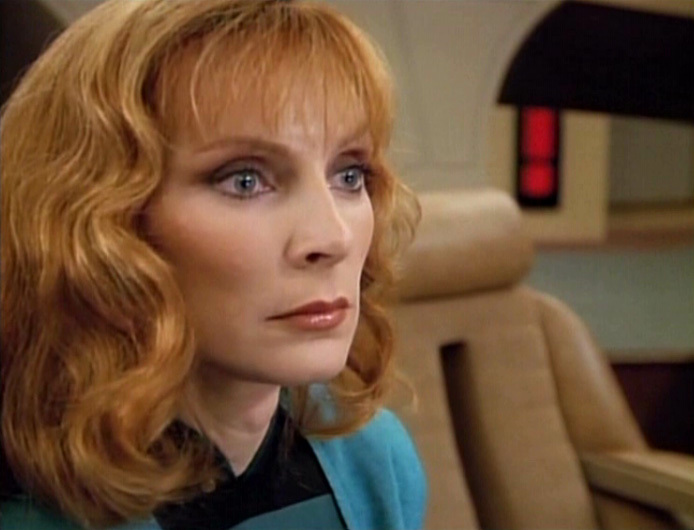 ), and both Riker and one of the chief engineers, Argyle, hesitate to allow Kosinski access to their engines at all. 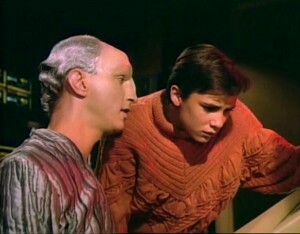 They eventually decide that if his calculations are gibberish no harm can come to the ship anyway, and allow Kosinski to go through with his experiment. Beginning at warp 1.5, the Enterprise steadily accelerates–but something goes wrong. Suddenly the ship is zipping past galaxies at incalculable speeds. Picard orders an emergency reverse of the engines, and when the ship comes to a full stop they realize they are (improbably) in the galaxy M33: 2.7 million light years from home. It will take over 300 years for them to return their own galaxy.